I realize this isn't really an icon, but what would the use for this be other than perhaps decoration? 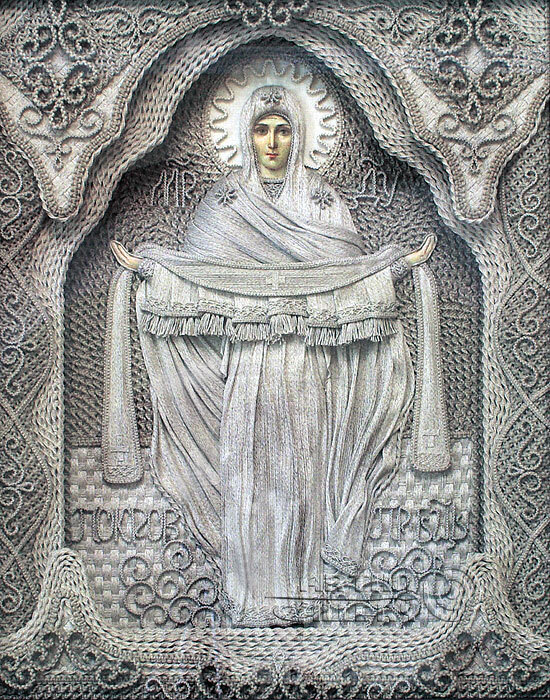 It's supposed to represent the footprint left behind after the apparition of Our Lady of Pochaev. Strange. It is indeed representing the miraculous footprint at Pochaev. 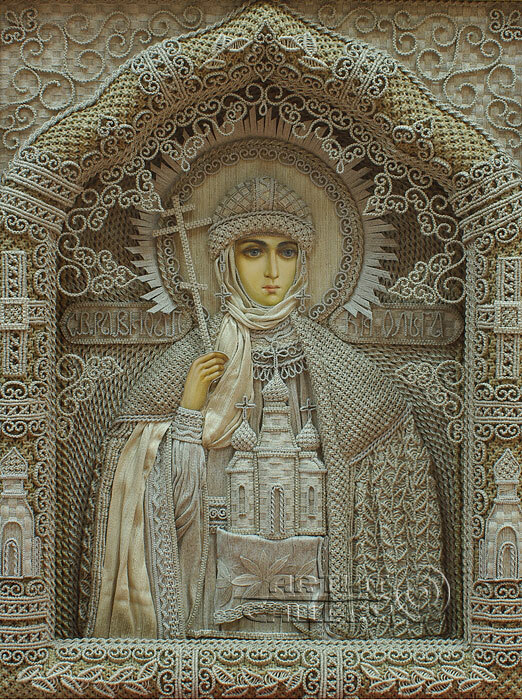 It would have been far better to have a properPochaevskaya icon which features the footprint (many of them do). The footprint of the Theotokos? 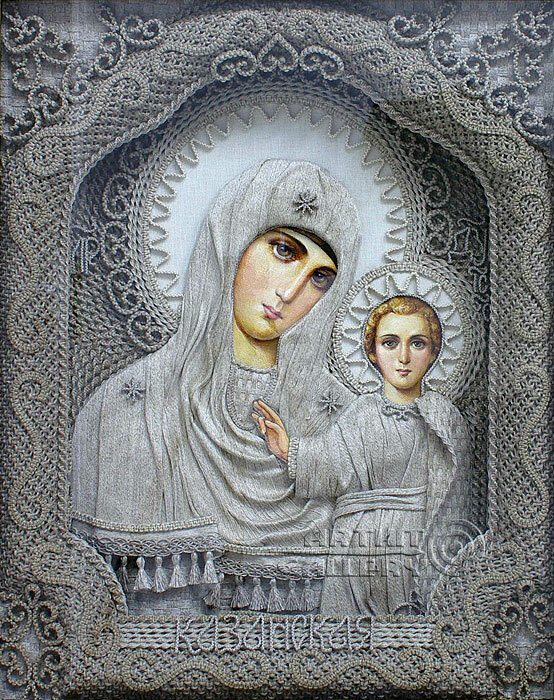 Found a picture of this Western icon, and I noticed it has oval-shaped halos for Jesus and the Theotokos, but a normal one for St. Joseph. This isn't the first time I've seen oval-shaped halos in more ancient icons. What's up with them? This illumination looks like it's from about the 12th century. It didn't take long after this, at the dawn of the Renaissance at the turn of the following century for haloes to be shown as flat disks or transparent ovals, with their centers over the crown of the saint's head. So was there any specific reason behind their using both oval halos and round halos at the same time? 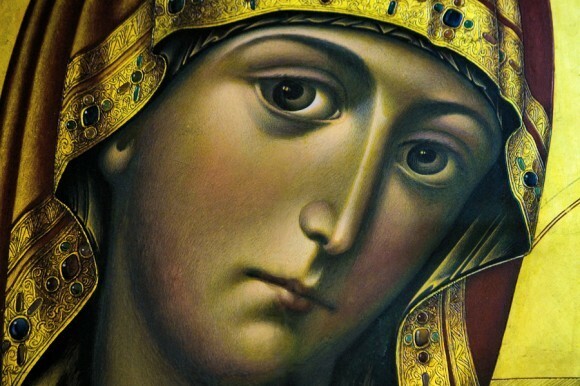 When I saved this icon of the Theotokos from an online image, I noticed that the eyes are two different colors. What does this mean? I've never noticed this in icons before. Wow. That's interesting. 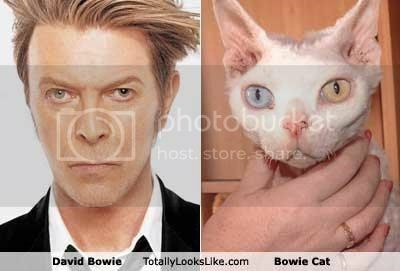 Was it painted by Bowie Cat? The eyes are not two different colors. There is a rectangular patch of light haze over the eye on the viewer's right (the Virgin's left) which gives a bluish tinge to the area covered by the haze. The hazy patch is most likely a reflection in the glass covering the icon (such as a distant window), which the photograph picked up. Thanks! Now I can see it. Yes, it's from that nice thread you started about the nuns. Some wonderful photos there. ^I actually like those. Especially the first two, although the first is better. I liked the macramé icons. My mom did macramé in the 1970s and made macramé purses, plant hangers, owl wall hangings and even a big macramé thunderbird. But nothing like the icons. That is some serious skill there. Those macramé icons are all beautiful. LBK, what do you think about this one? 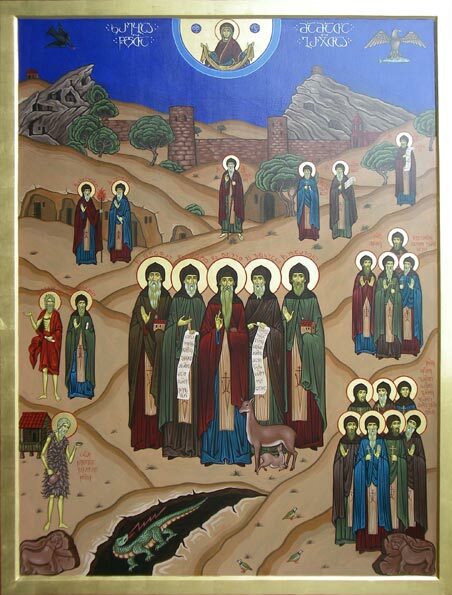 This is a version of the icon The Word Made Flesh, which is associated in some parts of the Orthodox world with helping in childbirth. It is a variation of the well-known icon Of the Sign (Platytera, Znamenniye). The "original" was of western origin, and showed the Mother of God bare-headed, with her hair draped over her shoulders. In this Georgian version, she is shown in her conventional garments, as she should be, though it would have been good to include the stars of ever-virginity. 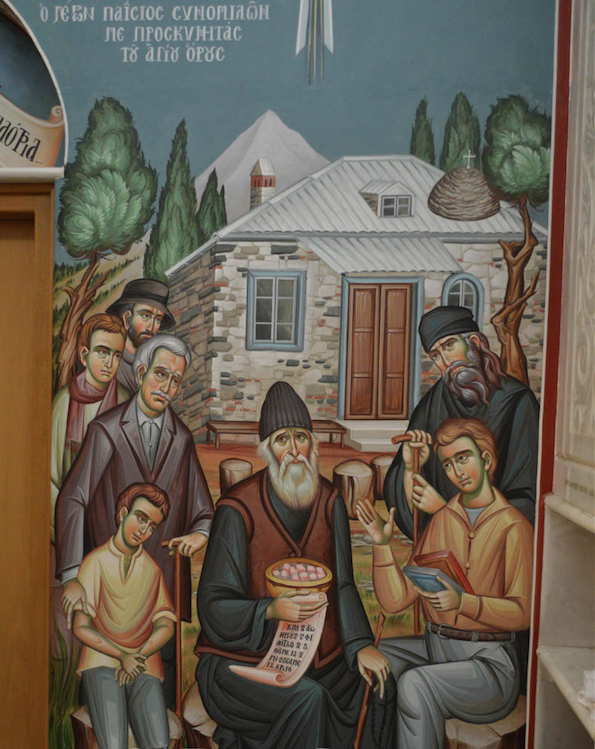 These show assemblies of saints, the first appears to show saints of a particular monastery (I can't read Georgian inscriptions); the second of a group of martyrs from a particular place. 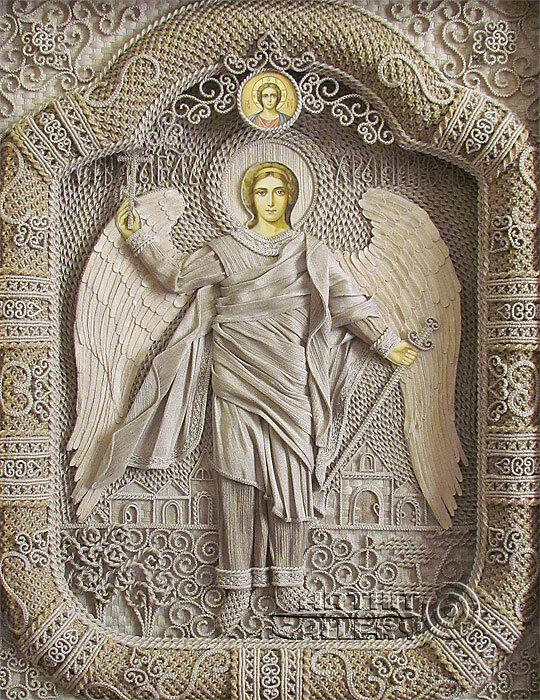 Similar icons can be found in other Orthodox traditions. Of a miracle of St. Menas. It seems one of the faces was removed/damaged and then was replaced with a cut out from another icon (painted in an entirely different style)? The ancients need to update their software and restart their computers. I also like the flagon and assorted foods. 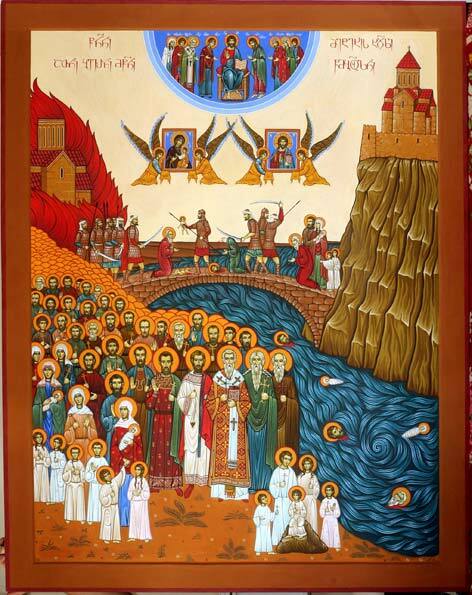 Yes, the face on the angel on the right is quite unlike the Ushakov style of the rest of the icon. The great question is what was behind this intrusion. This is not an icon intended for veneration, but a didactic image. The image of an anonymous "crucified monk" attempts to encapsulate the steadfastness of faith, humility, dying to self, and renunciation of worldly life. This version is rather graphic and lurid, I would say unnecessarily so. Other versions I've seen express the above, without the grand histrionics. What do the cups filled with flame represent? On other less "graphic" versions, the monk is actually crucified, so he isn't holding anything. Thank you. I haven't seen that version with the candles. Wishing everyone a blessed Feast of the Annunciation!!! As I was looking at some icons this morning, a few interesting ones popped up. While I understand the meaning of the fetus within her....at this point of her life, the fetus would not have been there, though. She was just being visited by Angel Gabriel and informed of what would occur if she agreed. ...and then this one was a shocker. 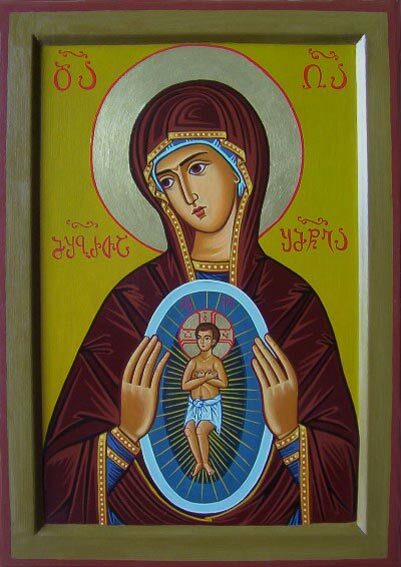 It seems this is depicting a pre-born Christ, which would be the oldest icon of such a thing I've seen so far (the others usually being motivated by pro-life stuff). It's apparently based on a 12th century icon, the Annunciation of Ustyug. I have a copy of this at home, but it's much darker than this image: I like this one because you can see the details better. I was looking for an icon of the Annunciation, and I picked this one because of the infant Christ peering out from within. Is He pre-born or just small? Well, since it's at the Annunciation Christ hadn't been born yet, and if you notice she's not actually holding him in any way. Yeah, you're probably right. I was too preoccupied thinking about "Our Lady of the Sign" that I forgot the Annunciation was the subject. The Ustiug Annunciation shows Christ as a Child, but still all-knowing, as is proper. The version posted by Liza shows an amorphous fetus sporting a halo. ...it's λουκούμι, which means GREEK Delight, of course! Served with GREEK coffee and a little GREEK water. Is it bad that I first wondered why there is a bee skep on top of the church with a cross on top? What is going on in this icon? "And she shall crush the serpent's head."